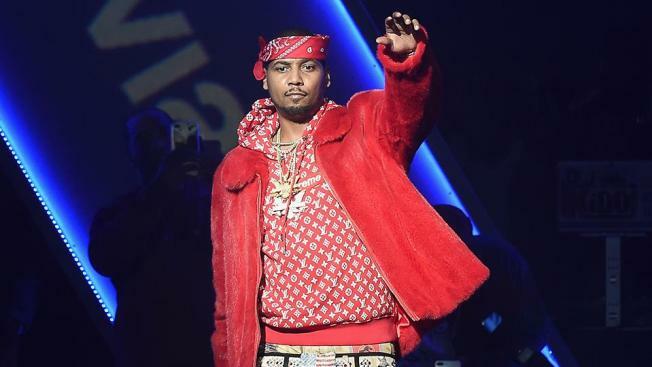 Rapper and actor Juelz Santana surrendered to authorities early Monday, just more than 48 hours after he allegedly ran from a security screening at Newark Liberty International Airport when Transportation Security Administration agents found a loaded gun in his carry-on bag, according to a criminal complaint. Santana, whose real name is LaRon Louis James, turned himself in around 1 a.m. The 36-year-old Harlem-born performer faces charges of possession of a firearm by a convicted felon and one count of carrying a weapon on an aircraft, according to the criminal complaint. According to court documents, Santana submitted a carry-on bag for inspection at Newark Airport's Terminal C around 6 p.m. Friday. As he waited for his bag to be screened, he allegedly asked the process move faster because he feared he would miss his flight to San Francisco, the complaint says. TSA agents discovered a suspected gun in the carry-on during X-ray screening and contacted Port Authority police. Once the "Love and Hip-Hop: New York" star realized his bag was receiving extra addition, he left the security checkpoint without his belongings, including his driver's license, and fled in a taxi. Further investigation of Santana's bag revealed that it contained a Derringer .38 caliber handgun, which was loaded with two rounds. He was banned from possessing a firearm due to a 2013 conviction for manufacturing and distributing a controlled dangerous substance. Santana is due in Newark federal court later Tuesday; his reps have not responded to NBC 4 New York's requests for comment. According to TSA regulations, bringing a weapon to an airport security checkpoint is punishable by a fine up to $13,000 and in some cases could lead to an arrest.